Plum Fruit is an amazing juicy fruit which belongs botanically to the family of Rosaceae. It is one of the few fruits that come in a panorama of colors. The plant which bears this fruit is a small shrub which is widely grown all across the world especially in China, United States, Japan and Europe. 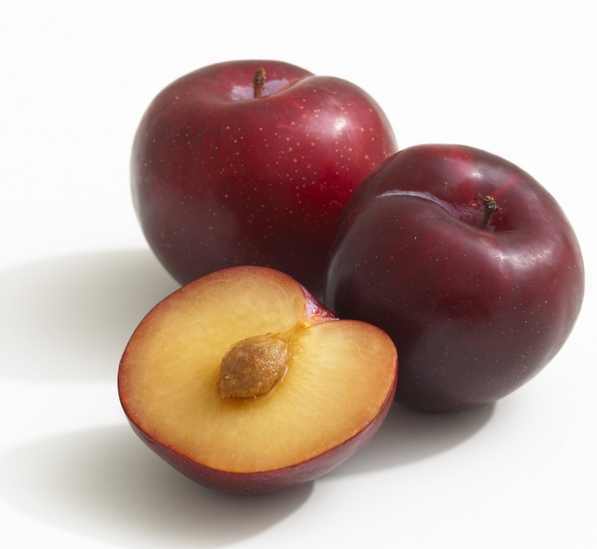 The skins of plum can be red, purple, black, and red, green. There is a large stone-like seed placed in the center of the fruit. Let’s see some of the wonderful health benefits of plums. Vitamin C in plum helps the body to develop resistance against infectious agents, counter inflammation, and free radicals. One medium-sized fresh plum contains 113 mg of potassium, which is useful to manage high blood pressure and reduce stroke risk. Plum is plentiful in minerals like potassium, fluoride, and iron. Iron is required for red blood cell formation. Potassium is an important component of cell and body fluids that helps controlling heart rate and blood pressure. It has low rank on the glycemic index, which means eating them can help you control your blood sugar and reduce the risk of type 2 diabetes. It is rich in vitamin C and phytonutrients such as lutein, cryptoxanthin, zeaxanthin, neo chlorogenic and chlorogenic acid. These components possess effective antioxidant qualities which help in preventing the damage caused by oxygen radicals called superoxide anion radicals. Plums are a good source of dietary fiber, along with the components sorbitol and isatin, which help in regulating the digestive system. In new research, it has been observed that consumption of plums have anti-cancerous effects and prevents the growth of carcinogenic cells. The dietary fiber of plums is beneficial in protection against gastro and respiratory cancers. Its extracts can kill aggressive breast cancer cells; the surrounding healthy cells were not harmed by the treatment. Regular eating of plums is good for vision and macular degeneration. Fresh yellow plum contains vitamin A and beta carotene good for eyesight and skin. Plums are beneficial in strengthening the immune defense of the body due to the presence of high vitamin C content. It promotes the body’s resistance against various infections and inflammations. Health Benefits of Plums by reducing anxiety in the body. Regular consumption of plums helps in reducing anxiety. There are anxiolytic effect and antioxidant properties of chlorogenic acids present in plums, which help in curing anxiety-related behaviors and damage caused by oxidative stress.